THE CROSS GUARD CAB AND WINDOW PROTECTOR isn't just a flimsy window screen. 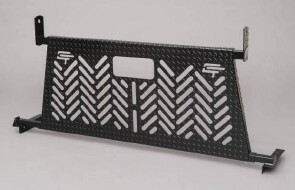 We're talking HEAVY DUTY... made from 3/16" Diamond Floor Plate Steel, this cab guard ADDS strength to your rack. A unique herringbone pattern maintains the steel's structural integrity and provides excellent visibility.